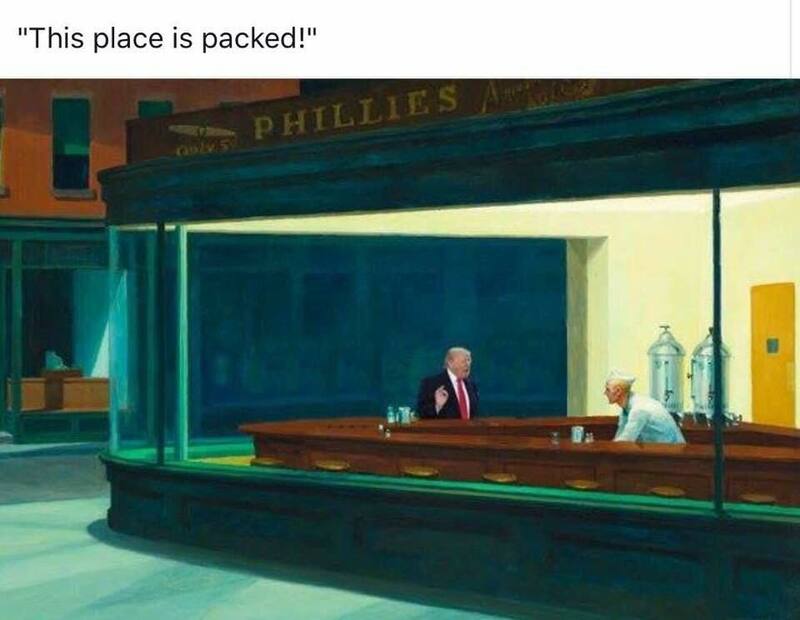 (Donald Trump version of Edward Hopper’s famous painting “Nighthawks” from Facebook). Art memes mocking Trump go viral is HERE. yep, look just like one of those Trump rallies! The one that he probably did not lie about was the millions of non-citizens voting in our elections. Strange how the focus has been on the Russians who had no impact v. these votes that may have impacted many state and local elections. What it is increasing clear Russia did do was direct a covert hacking campaign to steal private data and e-mails and direct the release of them in a way that it affected news and social media coverage of the election. It is also increasingly clear that Russian intelligence agencies paid for and directed a social media faux ‘news’ generating operation out of third party locations like Macedonia, Bulgaria and Croatia, that generated hundreds if not thousands of stories and posts and used bots and cut outs to spread those stories very widely–so widely that at one point during the election cycle according to US intelligence agencies there was actually a higher volume of falsely generated stories from these cut outs that legitimate media stories–which were then picked up by the so called legitimate media and re-reported as sourced stories. It is also abundantly clear from DNI and FBI analysis that Russian directed or affiliated hackers broke into at voting databases in at least 21 states. It is widely reported that this was done at the direction and with the oversight of the operation of Vladimir Putin. We have direct, multiple sourced data to support all of my contentions above. If that does not warrant a deep and wide investigation of the ability of foreign agents to interfere in US elections thus putting our democracy at risk, regardless of course, I don’t know what does. The motivation for the fact that the POTUS doesn’t want that investigation to occur in an open and fair way, overseen by American intelligence agencies and a Congress who has constitutional oversight authority over those investigations and independent investigative power, is still unclear. But the more he resists the clearer it is that he is hiding something–like long term financial ties to Russian investors for his real estate projects–that cannot be confirmed without seeing both his taxes and full corporate financial records. Whether Mr. Trump’s motivation is corruption, or his clear and oft stated or intimated desire to tear down and discredit American governance institutions, is still unclear. But you go chasing those 1 in 1,000,000 illegal immigrants who vote if you want to—they are a clear and present danger. Interference by any foreign government is very series and of course the Russians have been enemy #1 on that front for at least sixty years! I think we have no lack of investigations on that front and so far it appears that our intelligence and election officials prevented any real harm once again and I am sure are already preparing for the 2018 elections. Voting by folks with no identity or non-citizens is another matter which I will comment on below. The system, called Crosscheck, “Caging,” “purging,” blocking legitimate registrations, and wrongly shunting millions to “provisional” ballots that will never be counted. Illegal voting from those “non-citizens”— like the millions at the Inaugural ——————- sure. The only way they could win was to eliminate the votes of non-white guys—and they did so by tossing Black provisional ballots into the dumpster, ID laws that turn away students—the list goes on. It’s a web of complex obstacles to voting by citizens of color topped by that lying spider, Crosscheck. Ooga booga is right. I have not heard of such a paranoia. That Trump and those wascally Republicans really know how to win. There was no “gutting” of the Voting Rights Act. It simply stated the states that were under a pre-order met the laws rules over time and were now released. A few state. A newly released study of the 2008 election says up to five million illegals voted then. Not some Republican dtudy. As far as purging that is a common lawful practice of th Registrar of Voters in every jurisdiction. Mr. Diaz probaby does it here. And that is some anti-white fantasy by Mr. Wilder. I am sure this will not be published and if deleted perhaps the blogmeister here can ensure that truth is told. One day I hope he will learn to reread his work and “cut from the bottom” — journalism parlance for self-editing (or in Todd’s case exercising self-control). Chip a person cannot cash a check or even attend a political party convention without a proper ID and yet some think requiring one to vote is a bad idea. Please explain that logic to me please. 34 states have some form of a voter ID law in place. Here is a link to review them. A single judge ruled againt Texas so they have now revamped the law and are going through the legislative process. Voter ID laws are a common method of voter suppression that disproportionately target voters of color. According to data cited by the United States Court of Appeals for the Fifth Circuit, which will hear any appeal of Monday’s order, in Texas “Blacks were 1.78 times more likely than Whites, and Latinos 2.42 times more likely, to lack” voter ID.The court also noted that, “Texas had become a majority-minority state” with “polarized voting patterns allowing the suppression of the overwhelmingly Democratic votes of African–Americans and Latinos to provide an Anglo partisan advantage.” The state’s Republican legislature, in other words, could use race as a proxy for partisan affiliation. By passing a law that would disproportionately target African Americans and Latinos, lawmakers could protect Republican rule. In other news- Water is also —-wet. That number sounds about right Bruce. I believe his popularity is around 34% and is dwindling. Hillary beat him by an estimated 3 million votes. If she beat him by another 3 million votes she still would have lost thanks to the electoral college. Go read the study and its critics for yourself and decide. 2) Determine how many of them are now on the voter rolls. 3) Determine how many voted in the presidential election which would be illegal. IF in the end there are only a handful, the President owes the nation an apology. If as I suspect it would run in the hundreds of thousands, then extrapolating this to the nation would mean that his two to three million figure was spot on. Seems like a golden opportunity for the Democrats to prove that the President was lying, but one has to wonder why they fear to go there. BTW, re: the “anti white fantasy” the Just Facts study that Todd inadvertently cites does not discriminate in its methodology for calculating 5.7 million illegal voters in 2008; it simply takes questionable survey data, extrapolates a number based on that survey data, and comes up with a number, applying the propensity of illegal aliens to vote to all aliens–even those from say Ireland, or Great Britain, or Australia…it does note make assumptions based on race…but Todd does. My comment on a “anti-white fantasy” has to do with the Voting Rights Act. My contention Todd is that how the VRA is implemented, and how it has been challenged by state laws and processes, is often intentionally directed by Republicans in control in many of these states at suppressing the vote of African-Americans and minority voters, who have a higher propensity to vote for Democratic candidates. Not only is the historical record clear on that court cases enforcing the VRA are. To think the VRA is race neutral or even should be is ridiculous; of course it protects all voters, but it was approved by Congress and enacted as law because of systemic racism in voting registration and access. The VRA is not race or ethnically blind, nor is it regionally blind, it specifically focuses on ensuring equal rights to historically discriminated against populations. In the long run that protects the rights of all voters. Steve, race is irrelevant, but proper ID’s and citizenship are vital to an honest electoral process. Seriously race is not irrelevant, the VRA was passed because of a history, to ensure rights. To say race is irrelevant is frankly to deny history. All races should have equal voting rights: To say that one race needs special voting rights is in a word racist. The VRA was passed as Frisch opines. But the SCOTUS decision said it was implemented to the point of irrelevance so they booted it as unnecessary. The rest of the country thinks ID’s are fine. And as a people we have accomodated voters so much they can vote on elction day without proof of anything. So many states want a photo ID or other forms of proof a person is a citizen. We need to remove the hyphens. Are we not all Americans? Yes….in bizarro world a process to create equal rights when there has been an endemic history of virulent racism is somehow racist….and war is eace, love is hate…doublethink lives! The intent of the VRA was to take down barriers that had been erected against primarily the Black race to prevent them from voting. That is a far cry from today attitude that the Black or Hispanic races need some sort of special treatment [like it is OK if you cannot figure out how to bring an ID to the polling place] because they are not as capable as those white folks. That is utterly ridiculous JOHN. There was never a requirement for voter ID when everyone voting was white…why are we so concerned now that people voting are non-white? I can grantee you my grandmother never had to provide an ID and she spoke German. I bet she never had to guess the number of beans in jar or bubbles on a bar of soap either. No one is saying there should be special right…that is a complete red herring..and I never said that. 11% of American voting age citizens have no ID and most of them are non-white or disabled …I guess its just a coincidence that voter ID is being pushed now…. Steve I am sure you have a source for that 11% figure, but do you really believe that one in ten folks in our everyday lives have no ID on them? Here in California I think it is illegal to not show some ID if you stopped by law enforcement. John it is not just an issue of no ID it is an issue of which ID. But yes I do think there are are a lot of people without a current valid Government issued photo ID’s. Think about it….if you live in a city and don’t drive you don’t need a license..and if you are not applying for a passport or benefits of some sort then you don’t need an ID. I know people who have no drivers license or state ID card but have a SS card, credit cards, pay utilities, etc. So first Todd, I am not “opining” anything…history is history, facts are facts, and saying one has a different opinion does not change the facts. But more important, the SCOTUS certainly did not ‘boot’ it—the question is not even a question of ID’s, and as a VRA fan I have not objected to ID’s, although it is important to note that fully 11% of voting age American do not possess a Government issued photo ID. The bigger problem is how the ID policies are implemented. For example allowing use of a gun permit but not a college ID in Texas; or not allowing the use of a State Employee ID card in North Carolina where a majority of state employees are African American; or allowing the use of a utility bill but not a food stamp benefit card in Ohio. The SCOTUS held that those states were in compliance, therefore, they removed the “prior restraint” on them for voting. Those states were now not required to get a Justice Department review before implementing their voting rules. And you are opining as your facts are incorrect. Therefore that is a opinion. A ID can be many different things but to say one is hard to get is untrue. Anyone can get one. And many states said they would even pay the bill for them. A free ID! On the road to tyranny the first thing to go is the truth. When people focus on what they want to hear versus what is actually true, the door opens. It begins with open hostility toward verified reality and the presentation of lies and distortions as if they were fact, followed by constant repetition. The fact that this discussion of voter fraud is even taking place is a clear example. That millions of undocumented immigrants voted in the last election is a complete fantasy and has been disproven multiple times. That millions of legitimate voters most of whom were likely Democratic voters were purged from voter roles; that Republican controlled states have passed laws that make voting more difficult for poor and minorities, who most often vote for Democrats, has been proven multiple times. The Supreme Court recently ruled that North Carolina’s redistricting scheme intentionally sought to minimize the voting power of African/Americans and thus increase the odds of Republican control. They will soon take up of the issue of gerrymandering in general as a way to influence the outcome of elections. Hopefully, conscientiousness will overcome the politics of the corporate court. Benghazi, Benghazi, Benghazi. Crooked Hillary. Bad hombres. Voter Fraud. Hitler’s propaganda chief Joseph Goebbels said “If you tell a lie big enough and keep repeating it, people will eventually come to believe it.” Vladimir Lenin said, “A lie told often enough becomes the truth.” Donald Trump says. “fake news, fake news, fake news.” And now we have Trump supporters blindly echoing his lies as our nation starts down the path. I worry for my grandchildren. Joe, as I pointed out above, California can put all of the voter fraud stuff to bed with a simple analysis. Redistricting is another whole subject and I suspect we are in agreement on that front. I worked years ago with Don Sebastiani on a plan that would have largely taken partisan politics out of the process here in California and we were shocked, simply shocked, to find that it was opposed by BOTH political parties! This is a solution searching fro a problem. BTW aren’t conservatives concerned about retiring everyone to have current government issued ID’s? I remember years ago when conservative though social security numbers were an invasion of privacy and risked allowing too much power for government. I guess that is not a problem anymore? There is no need for a national ID system: Each state can have its own system. I think i said government issued. Steve, WOW it only took getting to the third paragraph to find out that I am in that 11%! I moved last year and my driver’s license still has my old address on it! Yes, and that means in North Carolina and Wisconsin you would be turned away at the polls under their laws…. Sorry it took until the third paragraph, but the 11% in the Brennan study is people with NO government issued ID not inaccurate government issued ID. Actually, allow me to modify that, you are CORRECT and I AM WRONG…the 11% included inaccurate ID….the American National Election Studies 2012 I was reading counted total with NO ID. That is a 2006 study which did not mean a thing in later elections. And the government takes provisional ballots anyway. IF I knew that I needed the right address on my license to vote, guess what I would do? The entire philosophy being advanced here is that we should create barriers to voting rather than making voting easy and creating oversight that can determine if voting is occurring illegally. By creating barriers you suppress the vote rather than policing violations. it is entirely backward, and I would argue intentionally, because you know the people suppressed are likely to be be poorer, darker and more likely to vote Democratic. A ID is no barrier. Steve, I would certainly agree that we should make “voting easy and creating oversight that can determine if voting is occurring illegally.” Having registration require a valid ID is the simplest way to accomplish both of those goals. The American National Election Studies 2012 (ANES) is a 2012 study. I would argue that the results between 2006 and 2008 would to have changed much in a population of 310 million people. And just to be clear, provisional votes are always counted if the number of them is sufficient to change the outcome of any election on their ballots. This is why the final tally in some close races can take weeks to determine. I am quite confident that racial minorities in America are fully capable of figuring out a ID requirement. It seems to me the “plantation owner” mentally suggesting they are incapable of comlying is really ridiculous. Anyoe who thinks blacks are inferior should read Dr. Ben Carson and other like Thomas Sowell. They favor a ID. And they say they are fully capable of complying wth that simple task. So what do you all think California has to hide??? I don’t think CA is trying to hide anything. I think they are refusing to play along with one of the most corrupt politicians in Trumps stable of fools and crooks. When Kobach tried to restrict voting in his home state the Supreme Court tore him a new one and over ruled virtually everything he tried to pass. Just last week, in court, he was sanctioned and fined for being without integrity and lying to the court. Why would anyone with a functioning brain, and an ounce of their own integrity be willing to play along with this moron. Kansas Secretary of State Kris Kobach confirmed in a letter Thursday that the single objective of Trump’s commission on voting is to find evidence to corroborate the president’s lie that voter fraud impacted the 2016 election. Yet no such evidence has ever been found, and no one person has ever been charged. Not one. Trump — the Lying, birther, crotch grabbing, tax evader isn’t qualified to be on the city council of some backwater town in Appalachia. And Kobach? He should be worried about the next election being run by Russia, instead of wasting our time and money on ghosts. But no, there is no plan to protect us from foreign hacking, not one. Chip are you saying that non-citizens should be able to vote if they have a temporary driver’s license? Bruce if a state does not think they should work with this man, they should at least show that they have handled their rolls properly. I am sure back in the day when those who passed on were still voting in the Chicago area, all the election officials assured folks that the rolls were fine and would have fought efforts to compare the death certificates to the voter rolls. Bruce, my point is that IF California has nothing to hide, then they could prove or disprove the President’s claim almost single-highhandedly because of the size of our state and the list of non-citizens with driver’s licenses that they have on file. Run the cross check and if there are 123 people who voted illegally then there is no way the claim about 2-3 million can be true. If on the other hand five or six hundred thousand votes were cast from this data pool, then the President’s figure is very believable. Hey President Trump, If you have nothing to hide I would like to see your income tax returns! Here’s Paul Weyrich, co-founder of the Heritage Foundation and the Moral Majority, in a 1980 speech, explaining the importance of voter suppression to the success of the Republican Party. Voter ID laws, gerrymandering … it’s all aimed at the same goal: weakening the power of traditionally Democratic voters. I was around in the 1980’s when Mr. Weyrich was having a great impact and remember he and his people pointing out that almost all their tactics were simply things they had learned from the Democrat operatives from the 60’s and 70’s. Of course the critical question to ask about those ‘cross-check’ results is just how many legitimate voters were purged? If we took all those non-citizens in California off the rolls it would likely be a big purge, but are you arguing that they should remain? Read Palast’s report cited above, on the shoddy Crosscheck methodology so flawed that several states dropped out. Decide for yourself whether or not you are convinced by his argument. I’m convinced by it, but I’m not going to engage in the argument myself because I feel it is a colossal waste of time. AND as I pointed out elsewhere, provisional ballots are always counted if there are enough of them to sway any item on the ballot.